Thanks to DNA testing, it’s never been easier for adoptees, foundlings, and others of unknown parentage to find their birth families. But how can DNA tests help you connect to family, and what do your results mean? 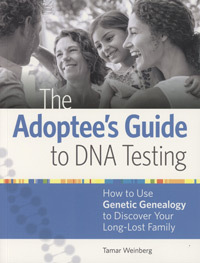 Enter this book: a comprehensive guide to adoption genealogy that will give you the resources you need to find your long-lost family with DNA. This volume will cover all the basics of genetic testing, plus how your DNA results from services like AncestryDNA, 23andMeFamily Tree DNA, and MyHeritage DNA can help you build out your family tree. Don’t start with DNA. While it can be tempting to jump into DNA testing right away, start with traditional research techniques and records before turning to genetic testing. DNA testing’s usefulness depends on who has tested so far, and you could wait a long time before connecting with a DNA match in the database. Save before you send Before you contact a match (particularly a close match), grab a screenshot of the match’s information and (if possible) create a mirror tree. Many adoptees will make initial contact with a potential relative, only to be blocked by the other user or see the other person’s Ancestry.com account shut down. Some people test only to learn their ancestry and don’t want to be contacted by potential relatives, especially birth parents or unknown or long-lost children. Follow the paper trail DNA tests can take you back a few generations, but you’ll want to consult traditional records to support your hypotheses. Many adoptees and others with unknown parentage don’t have traditional genealogical documentation, but they can still try to match with someone who can/has created a family tree. Tamar Weinberg is a genealogy enthusiast, and writer, having authored the bestselling book The New Community Rules: Marketing on the Social Web. She’s appeared on CBS News and The Agenda with Steve Paikin, and has been quoted in Forbes, USA Today, Businessweek, and many other publications. She is an active participant in online communities relating to genealogy and DNA, and after thousands of hours of study and research, has helped solve many cases of unknown parentage. She resides in New York with her husband and their four children.